It has come to my attention that perhaps I was a little too harsh on Valentine’s Day in my last post. It can be a fun holiday, we just don’t make a big deal about it. I was trying to explain why we don’t make a big deal, and I guess my point didn’t come across quite like I wanted it too. I don’t hate Valentine’s Day! 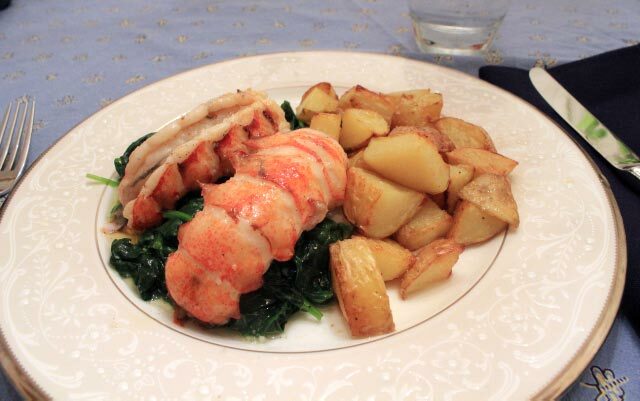 All that said, we had a lovely Valentine’s Day dinner this year, inspired in part by this week’s delicious French Fridays with Dorie recipe, Vanilla-Butter-Braised Lobster. 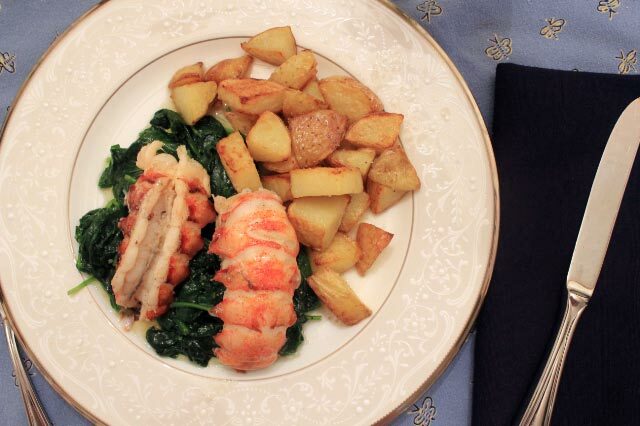 As the Dorista’s nominated recipes for the February line-up, it was decided that Vanilla-Butter-Braised Lobster would make the perfect dinner for Valentine’s Day. Great idea, and great excuse for a special dinner! The recipe calls for live lobsters, but Dorie helpfully suggests that previously frozen lobster tails would work as well. I opted for the lobster tails. It was interesting to me to see the varying amounts people had to spend to purchase their lobster. I was lucky to run across a “one-day sale” at Whole Foods, and picked up 4 small lobster tails for only $20. I have never cooked lobster before. Heck, I have only eaten it a handful of times. One thing I would love to experience some time is super-fresh East Coast lobster cooked at the source. Some day! Anyway, I was surprised how quick and easy lobster tails are to cook, when they are braised in clarified butter. Dorie’s twist is to add a vanilla bean. I found the vanilla flavor to be very subtle, but delicious. I rounded out our special meal with Lemon-Steamed Spinach and potatoes roasted in duck fat. Decadent and delicious! I’m a week late on another FFWD recipe: Couscous Chicken. This one is a North-African-inspired dish that makes a very satisfying dinner. What makes Chicken Couscous special and exotic is the spice mix: fresh ginger, cumin, turmeric, saffron, cinnamon, and garlic. The chicken and spices are stewed together with a variety of vegetables, including, leeks, carrots, celery, and zucchini. The final touch is garbanzo beans. The whole thing is served with the traditional couscous. Dorie has us cook the couscous with some of the stew’s broth, lending the pasta the same exotic flavors as the rest of the dish. I loved this! I found it so satisfying and delicious. Best of all, it made enough for two night’s worth of dinners! This post participates in French Fridays with Dorie, an online group dedicated to cooking our way through Dorie Greenspan’s wonderful book, Around My French Table. Happy Friday! I kept my promise and made two French Fridays with Dorie recipes this week! I’m feeling motivated because I only have six back-log recipes to complete. Most of them are good Fall/Winter recipes and I plan to hit them this year, so I don’t miss my final window (the group will be finishing the book around April or so next year). So, what did I make? The official recipe of the week was Couscous Salad. It was a pretty easy recipe. 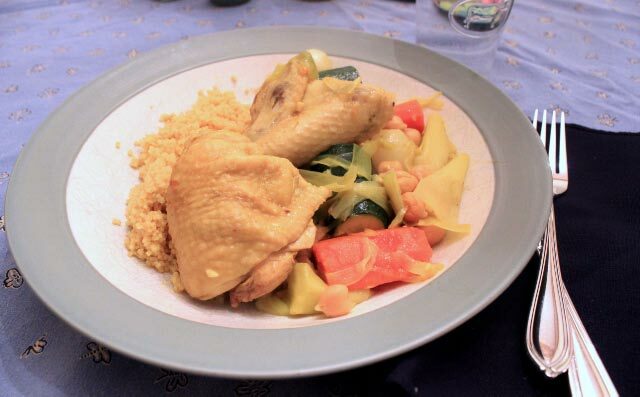 Quick-cooking couscous was cooked in a mixture of chicken broth and spices along with raisins. After it was cooked and fluffed, it was tossed with diced cucumber, red bell pepper, carrot, sugar snap peas, and chickpeas. A simple dressing of lemon juice and olive oil, and a sprinkling of cilantro, and it was done. I served it with the optional Lemon-Grilled Chicken to make it a full meal deal. I don’t quite know what to say about this recipe. We liked it well enough. I just think the flavors are not favorites of ours. I thought I would eat the leftovers for lunch the next day, but I couldn’t quite muster the enthusiasm for it. So, we didn’t hate it, but we didn’t love it either. I won’t be making this one again. Gérard’s Mustard Tart goes way back. It was the second recipe the FFWD group made back in October 2010 (before I joined in the fun). The recipe in the book is Dorie’s friend Gérard’s take on the traditional mustard tart with tomatoes. Since we have gorgeous garden tomatoes right now, I knew I had to make the original version of this tart, which Dorie helpfully includes instructions for. This truly is a mustard tart. The filling consists of lightly beaten eggs, heavy cream, Dijon mustard, and grainy French mustard. I topped it with two sliced tomatoes and a sprinkling of thyme leaves (my addition). We really enjoyed this tart! The flavor of the perfectly ripe tomatoes was delicious against the piquant flavor of the mustard. This one I ate the leftovers! What will I make next week?